I got my lifer Connecticut Warbler from the Morning Flight Songbird Count back in the fall of 2011. 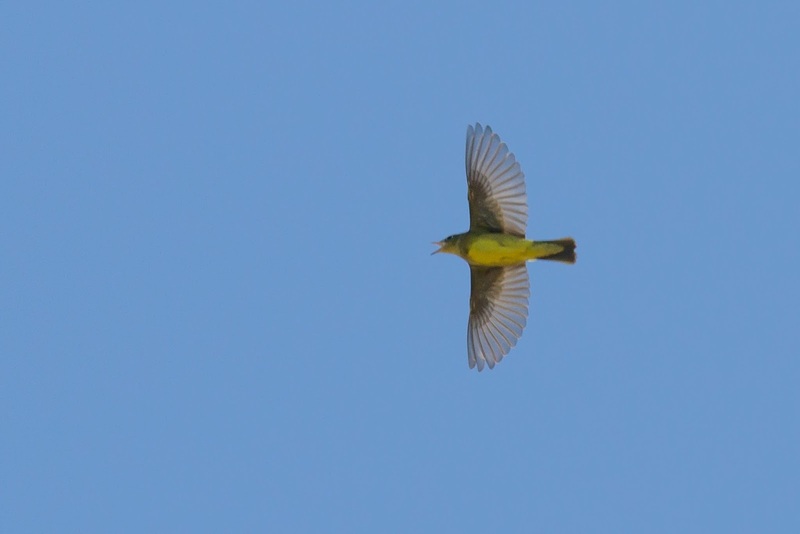 Yes, I saw it flying high overhead the "Higbee Dike", or more accurately, someone called it out and I got on a large bodied, yellow-bellied, gray/brown-headed warbler flying overhead and away. As you can imagine, it left me wanting a better view. Connecticut Warbler had been my nemesis bird for many years, but I consistently justified it each year by saying "yeah, but they're hard hard to see, they're skulkers, they're notoriously shy (except when they're not) and they come through Cape May during a small window of time each fall". The reality, of course, is that Connecticut Warblers are actually quite common during their migration window, and the habitat on Cape Island is quite good for them such that with some understanding of where and how to look, and an eye on the date, you don't have to wait a lifetime to see this highly prized wood warbler, and you don't have to see it as a fleeting glimpse from atop the Higbee Dike (although that too is a thrill of its own!). We at New Jersey Audubon's Cape May Bird Observatory, with the help of a dedicated volunteer, have recently completed development of a research database for all of our migration count data (the Cape May Hawkwatch, Avalon Seawatch and Morning Flight Songbird Count...the Monarch Monitoring Project is next!). This will allow us to analyze and to collaborate on analyses of our datasets to better understand bird populations and inform our conservation priorities. As I was preparing for a talk to deliver in Sweden in early September, I ran analyses on several species of concern for which we have data in our database. I also considered the fact that birders from Europe are interested in seeing our North American Wood Warblers, and Connecticut is at the top of many lists due to their secretive nature. When I crunched the numbers on CONW (the 4-letter alpha code that bird banders use for Connecticut Warbler) I was impressed with how well the data described the small window of time where CONW peak in Cape May. While the bulk of CONW pass through Cape May during the latter two weeks of September and the first week of October, the top three high count dates occurred on September 13, 17, and 21 in three separate years. 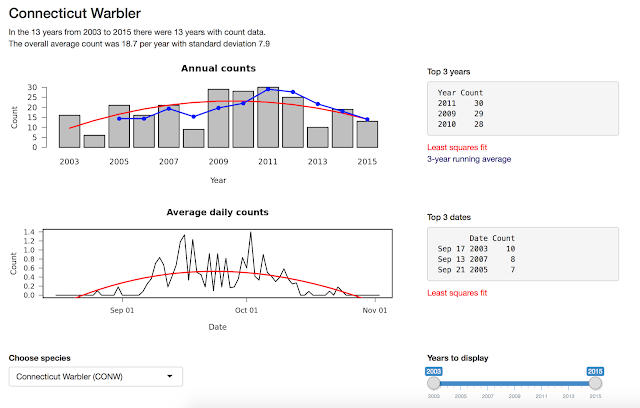 The top three years for CONW were 2009, 2010, and 2011, over which two different counters counted (so not the effect of a single hotshot counter). So if you were looking to maximize your chances of seeing a Connecticut Warbler during fall migration, a good bet would be to aim for the latter half of September, especially during the 13th - 21st timeframe. Looking at this year, we didn't see CONW numbers start to materialize until this past week with a few earlier records on the 8th and 12th of September, while most came in after the 21st. So far this year eight individuals have been tallied from the Morning Flight Songbird Count with a daily maximum of two. 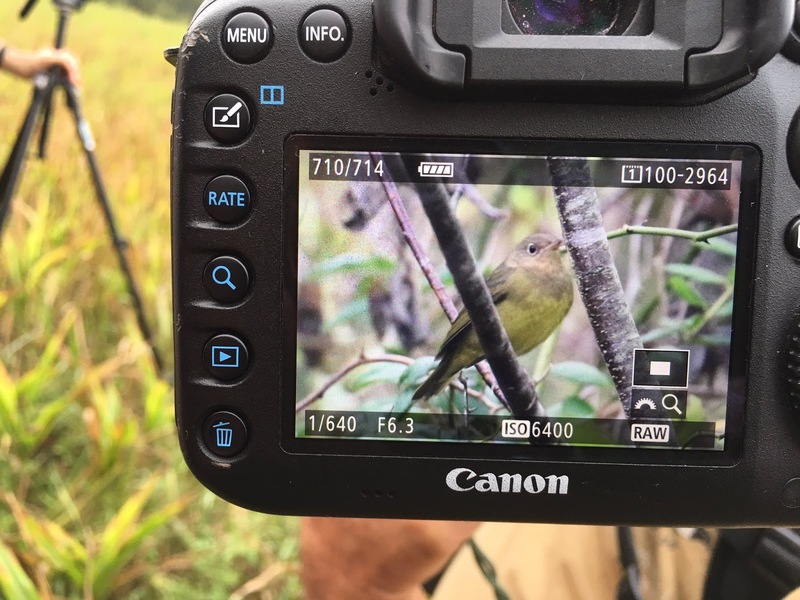 While it's not shaping up to be a record CONW year, there have been several cooperative birds around Cape Island posing long enough for folks to get a look, and even some photos. On Cape Island Connecticut Warbler like ragweed (Ambrosia sp.) and the fields at the Higbee Beach Wildlife Management Area are full of it! These little skulkers also like a variety of field plants in the aster family, so diverse fields including ragweed and things like goldenrod (Solidago sp.) are places where you can strike CONW gold during peak migration. Of course these birds are skulkers, preferring to walk away from you rather than fly, so patience is key. These birds are actively migrating, so like other actively migrating warblers they are seeking out food and shelter during the day. Early mornings after a night of northerly winds at Higbee can be productive as birds tend to be settling in after a nocturnal flight. They're hungry, and searching for where they will spend their day, and therefore tend to be more visible. As you walk the fields, look for birds flushing short distances from you. Common Yellowthroat is also common throughout the Higbee fields, but with a little scrutiny can be quickly discounted. CONW is larger overall, larger bill, chunkier-bodied and rounder-bellied, with complete yellow underparts, and has a distinctive full eye-ring with a light brown (but contrasting) hood in young birds, and gray hood in adults. Young and adult female Common Yellowthroat in contrast have yellow primarily in the under tail coverts and throat, with a white belly and dingy olive chest, and a broken eye-ring. Nashville Warbler is less common but definitely present and also noticeably smaller and more "flitty" than Connecticut Warbler. They do have a complete eye-ring and gray head, but show a yellow throat and breast (not a hood as in CONW) and show extensive white around the legs and belly contrasting with yellow undertail coverts and throat. Nashville Warbler also commonly feed at the tops of Goldenrod and other seed-bearing field plants with apparent disregard for birders, something very atypical of CONW. Now that you're equipped with the skills you need, I hope you head out and find some Connecticut Warblers! If you find yourself in Cape May, please stop by the Northwood Center and we can fill you in on what's been seen most recently, including any known sightings of Connecticut Warbler, and of course we'd love to hear your stories if you've been successful, either in person or in the comments of this post. For full details on what's going on in Cape May, download our quarterly program guide, the Kestrel Express, here. 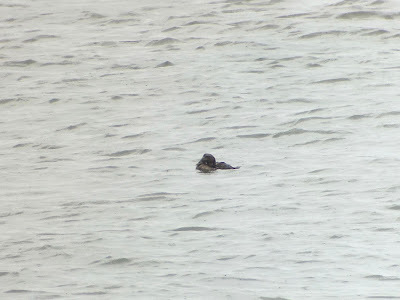 Tis the season when all three species of regularly-occurring Jaegers (Skuas for our friends across the Atlantic) vacate their breeding grounds on the Arctic tundra and flood down both coasts to spend their non-breeding life out at sea. Here in Cape May our most common jaeger seen from land is the Parasitic Jaeger (Pomarine are more often far offshore, and Long-tailed are simply rarer, but regularly encountered on offshore pelagic trips in small numbers). While individual Parasitic Jaegers can be seen year-round here (which include some non-breeding birds that spend the summer offshore), fall is one of the best times to see numbers of these pirates of the high seas including their wide range of variation in age and color morph. 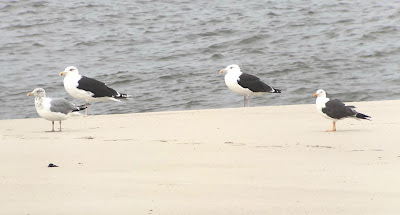 One of the best areas to view these birds is in the Cape May "Rips", the tumultuous upwelling caused by rising and falling tides streaming over and around underwater topography at the mouth of the Delaware Bay. These upwellings bring nutrients to the surface, which increase food availability from the tiniest zooplankton to the largest marine mammals. In the middle of this faunal continuum, of course, are the birds; dominated by gulls and terns. Cape May "Rips", October 2015. 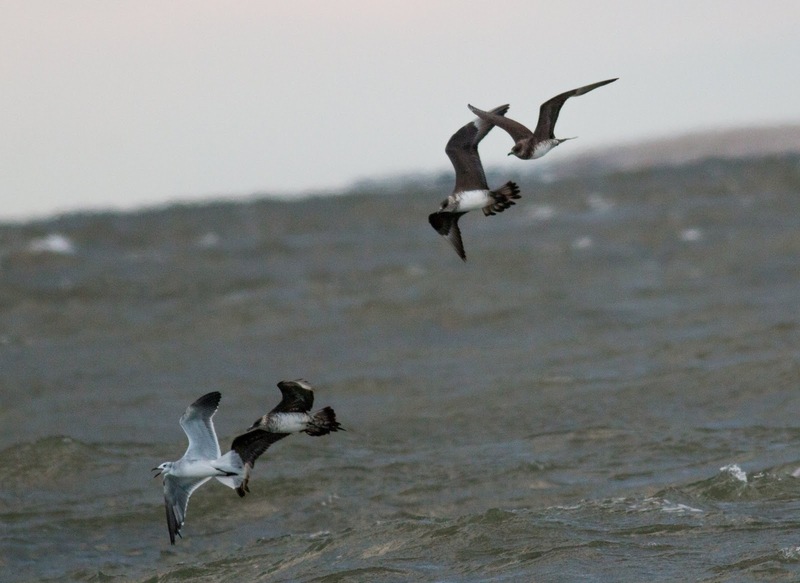 Parasitic Jaegers get their name from their tendancy for hunting down gulls and terns and chasing them until they regurgitate their last meal, then swooping down and gobbling it up themselves. Kleptoparasitism, literally parasitism by theft, is the term used to describe this behavior. Knowing this behavior can actually help you determine whether you're looking at a jaeger in the melee of feeding gulls and terns. Cape May "Rips", September 2016. Now is a good time to keep track of the local tides, and get out to one of several locations around Cape May Point where viewing the rips is best. The Coral Avenue and St. Mary's dune crossovers can be excellent, as can the dune crossover at Brainard Ave. Our 2016 Hawkwatch Counter, Erik Bruhnke, has also been seeing them right from the hawkwatch platform at Cape May Point State Park! The best time to maximize your chances of seeing multiple jaegers is during the three hours before low tide, as the Delaware Bay empties into the Atlantic Ocean, bringing many nutrients with the outgoing water. The second best time is on the rising tide, again, beginning about three hours prior to high tide. Of course the magnitude of the rips behavior is dictated also by the amount of tidal fluctuation, so tides closer to new and full moons are going to produce more upwelling activity, which means that right now is a great time to scan the rips for jaegers! (the full moon was only a few days ago). 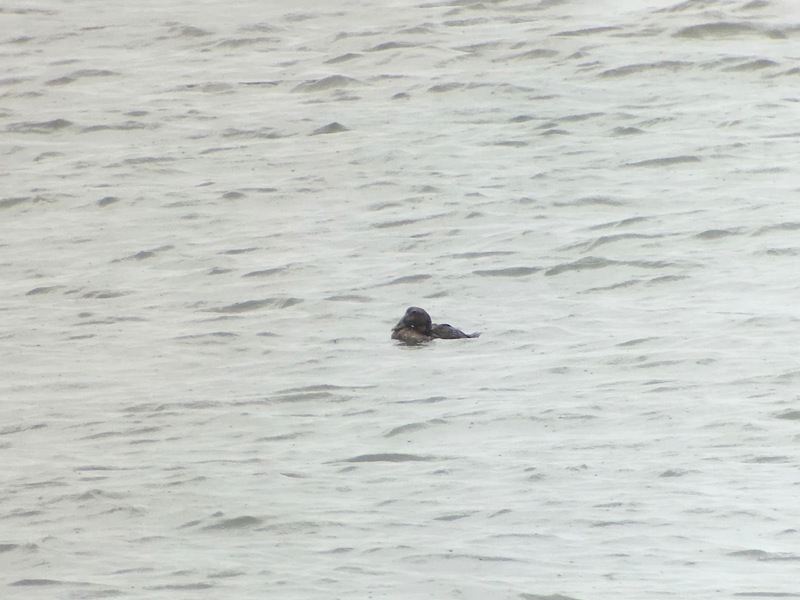 As of yesterday there were up to six Parasitic Jaegers visible during the hours prior to low tide. How many will there be today? You'll have to go and find out! but when they pose together nicely like this, they're downright easy! For more information please feel free to stop by NJ Audubon's Cape May Bird Observatory, at 701 E Lake Drive, Cape May Point, 08212. We're open and here for you daily from 9:30am - 4:30pm. A hawkwatch has been conducted at Cape May Point State Park every year since 1976 - yes, we're celebrating the 40th Anniversary (check out all the exciting happenings at the Cape May Fall Festival)!! But, it's so much more than just a great hawkwatch. It's the social hub of the Cape May birding scene, a source for birding and local information, and one of the best sites in Cape May for all types of birding. From cormorants to warblers, you can see it all from one place. With the water levels receding in Bunker Pond, directly in front of the platform, the herons, egrets, gulls, terns, and shorebirds have been taking center stage. September alone has produced a number of notable sightings, including Red-necked Phalarope, Wilson’s Phalarope, Baird’s Sandpiper, and Marbled Godwit. 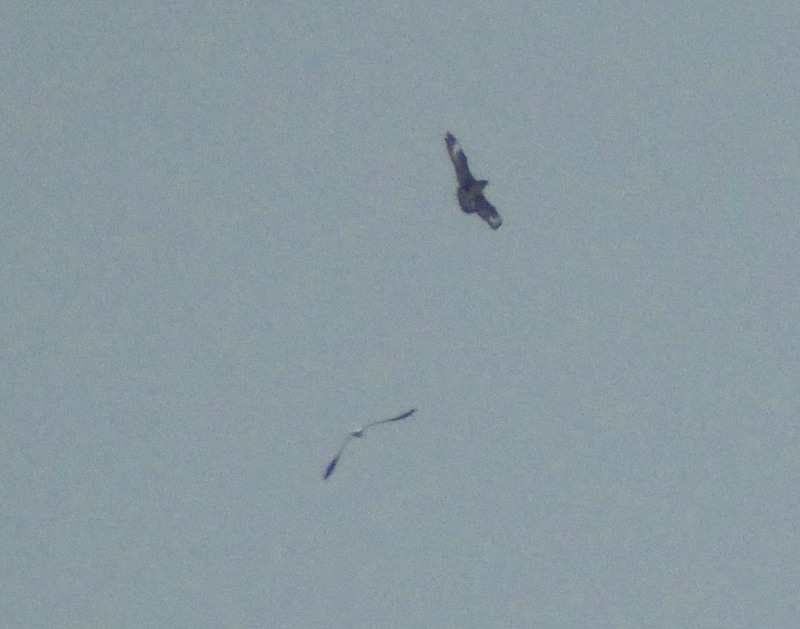 And don’t forget – there’s lots of hawks, too. Come out and join us!! The Cape May population swells in summer, by some estimates between 40 and 50,000 tourists. By Labor Day, though, the throngs of beach goers subside and a new group of visitors begins to replace them. The birders. 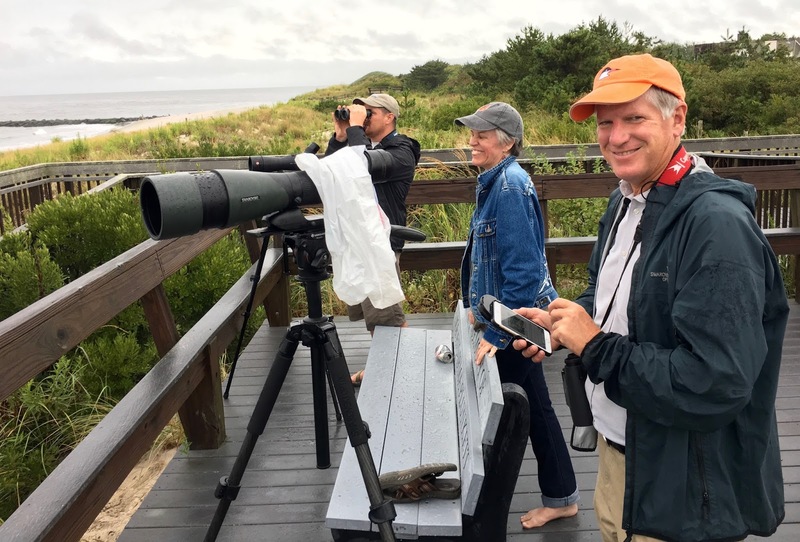 Cape May, as you know, is Mecca for birds and birders each fall and New Jersey Audubon's Cape May Bird Observatory is the organization that serves both of them. Each year since 1976 CMBO has counted the hawks migrating over Cape May, en route for points south, from the Hawkwatch Platform at Cape May Point State Park. Since 1990 CMBO has counted the monarch butterflies migrating en route to Mexico, our second longest running monitoring project. Since 1993 we have had a paid counter positioned in Avalon to quantify the migration of southbound waterbirds, most recently from September 22 to December 22, sunrise to sunset, on the beach between 8th and 9th street at our new Seawatching Center constructed by our partners, the Borough of Avalon. Since 2003 we have staffed a daily count of visible songbird migration that occurs in the first hours after sunrise, from atop the "Higbee Dike" dredge spoil, at Higbee Beach Wildlife Management Area. In short, CMBO has its finger on the pulse of migration in Cape May. But collecting data is only part of the equation, and just as important as collecting data, is connecting people to nature through our innovative programming. We, of course, do this throughout the year with our all-volunteer Associate Naturalists and Field Trip Leaders, but each fall we also bring on a crew of Interpretive Naturalist Interns in addition to our counting staff, to engage all of the visitors who come through Cape May during the autumn migration period. This great team of naturalists represent the future of conservation, and will forever carry forth the torch of New Jersey Audubon wherever they go from here. Before the start of the season, we held the first "orientation week" in the history of these seasonal positions, and it was a roaring success. A mix of presentations and experiential learning, led by the region's top ornithologists, educators, conservationists and field naturalists, the Class of 2016 experienced a full immersion into Cape May migration ecology and interpretation. Now we'd like to introduce to you our Class of 2016 interpretive naturalist interns and counters, and hope you will come and visit them at the various count sites throughout the 2016 fall season! I was born and raised in northern New Jersey, but have lived in Cape May County the last 3.5 years, so I am no stranger to the magic of birding in Cape May. I became fascinated with birds at the age of 6 and have never looked back since. My passion for birds and wildlife brought me to Stockton University where I majored in Environmental Science. After graduation, I worked at Edwin B. Forsythe NWR, where I was involved in various marsh related studies involving sea level rise, as well as American Black Duck carrying capacity. For the past 2 years I worked with the Conserve Wildlife Foundation of NJ doing Piping Plover monitoring. When I'm not watching and photographing birds, I like playing basketball and tennis. Lindsey grew up on a farm in White Lake, Michigan and developed a love of nature early on. She attended Oakland University in Rochester, Michigan where she studied film, focusing on the genre of documentary. This is her third year working as a naturalist for the Monarch Monitoring Project in Cape May, New Jersey. Before heading to Cape May for the fall, Lindsey spent the summer working as a naturalist at the Walking Mountains Science Center in Avon, Colorado where she taught programs, lead guided hikes on Vail Mountain, and also gained her accreditation as a Certified Interpretive Guide through the National Association for Interpretation. Lindsey has also worked for New Jersey Fish and Wildlife as a field technician on their endangered non-game species team, monitoring endangered beach nesting birds along the Atlantic coast. When at home in Michigan, Lindsey is a volunteer at the Organization for Bat Conservation, where she has enjoyed learning about and taking care of insectivorous, fruit, and vampire bats. She is thrilled to be working as a naturalist once more for the Monarch Monitoring Project and for the chance to experience the magic of fall in Cape May. Erik Bruhnke has had a love for birds since he was a child. He graduated from Northland College in Wisconsin with a Natural Resources degree in 2008. Erik taught field ornithology various times at Northland College. During his first six fall seasons following college, Erik worked as an interpreter at Hawk Ridge Bird Observatory in Duluth, Minnesota and was a board member of the Duluth Audubon Society. He has counted migrating raptors at the Corpus Christi HawkWatch in Texas. Erik’s wildlife photography has won national awards, and his writings have been featured in Birder’s Guide via the American Birding Association, BirdWatching, and Birdwatcher’s Digest. Erik leads tours for Victor Emanuel Nature Tours as well as his own business, Naturally Avian Birding Tours. He loves to cook and bake in his free time, often while sipping bird-friendly coffee. Glen hails from Brooklyn, NY, but has called Cape May home for more than 16 years. Simply put, he loves living and birding here! Working for CMBO in the fall of 1999 (and subsequently in 2007, 2014, 2015, and 2016) made the biggest of impacts on him. Glen has/has had lots of jobs: professional tour leader, biological consultant, start-up-tech-company tech, grad student, bartender, musician, school teacher, garbage man, veterinary technician to name a few. He has traveled, explored, and birded in 47 states and over 20 countries. Glen has worked seasonally for CMBO as a researcher, naturalist, and salesperson and is very excited to be returning for a third consecutive year as the 2016 fall season's official songbird counter with the Morning Flight Project. He resides and engages in BBQ in Cape May Point with his wife, Christina "Kashi" Davis. Hi, my name is Kirsten Fuller, and I am the George Myers Naturalist Intern this year. I am from Woodstown, New Jersey and a graduate of Rowan University. I have a bachelors degree in biology and a minor in secondary education. So far, I have truly enjoyed my time working for New Jersey Audubon, and my experiences here have strengthened my interest in becoming a science teacher in the future. I am a recent graduate from College of the Atlantic. I grew up along the coast of New Jersey watching shorebirds with my Mother. Since then, I have immersed myself in seabird research and monitoring efforts. For two seasons I studied breeding colonies of gulls, guillemots, and petrels on offshore islands in the Gulf of Maine. Most recently, I monitored Piping Plovers and Least Terns breeding on the Rachel Carson National Wildlife Refuge. Whether I am banding a seabird or observing through my binoculars, I always enjoy my time being in nature and watching birds. A 6th-generation area resident, Tom is one of very few birders who can truly call Cape May home. He discovered birds at the age of ten and was immediately captivated by the spectacle of migration that engulfs the Cape May area. Tom has traveled through much of North America since graduating Rutgers University in 2011, with assignments that have ranged from wintering Piping Plover surveys in the Bahamas, to breeding bird atlas work in Wisconsin, to tour-guiding in Alaska, and of course, several fall seasons at Cape May. One of the area’s most in-demand birding guides, he has also appeared at various local and national birding events and represented CMBO at the 2016 Champions of the Flyway competition in Israel. In his spare time, Tom is a Regional Editor for the journal North American Birds, sits on the Board of Directors for the Hawk Migration Association of North America, serves as a statewide editor for eBird, and is a voting member of the New Jersey Bird Records Committee. Tom is perhaps the only person who has logged over 1,000 counting hours at both the Avalon Seawatch and Cape May Hawkwatch, and he was also responsible for developing the Cape May Springwatch, the area’s first full-time spring migration count. Tom’s leadership was instrumental in the creation of the Migration Count Coordinator position in 2015, and CMBO is thrilled to have him return in that capacity for Fall 2016. Maria is from Mount Airy, Maryland, and she grew up enjoying wildlife she found in her yard and on road trips with her dad. She recently graduated from Cornell University in Ithaca, New York, with a degree in Biological Sciences. Maria has enjoyed opportunities to travel and conduct field research on Black-throated Blue Warbler and Western Bluebird behavior. Her recent public outreach position at the Cornell Lab of Ornithology allowed her to share her love of birds and other wildlife with visitors through tours and trail walks. Maria is excited to be joining the naturalist team at CMBO and continuing to interact with the public. She hopes to study bird behavior in graduate school and begin a career involving teaching. Diane is a veteran monarch enthusiast with many years of public school teaching which included a focus on cross-curricular monarch studies. She also travelled to Mexico with Dr. Bill Calvert to visit El Rosario and Chincua - two major monarch overwintering areas. With a Master 's Degree in Environmental Education, Diane has organized much community outreach. She also studied rainforest ecology in Belize, and was an Earthwatch participant in Washington to help restore salmon habitat. She has frequently visited Cape May during the fall to witness the monarch migration. David grew up near Vineland, NJ. and has loved nature and animals his whole life. He recently graduated from Cornell University, where he took his birding skills to new levels, gained research experience with Acorn Woodpeckers, and traveled to other countries for classes. At Cornell he also worked for the eBird Team and lead tours and guided walks at the Lab of Ornithology. David is excited to fine-tune his raptor identification skills and contribute to a 60-year dataset at the Monclair Hawkwatch. David intends to continue his education by seeking a Master's degree next year.